Motherhood hasn't diminished Serena Williams' competitiveness. Pumping her fists and yelling her trademark "C'mon!," Williams survived the first big test of her Grand Slam comeback today. The unseeded Williams topped 17th-seeded Ashleigh Barty of Australia 3-6, 6-3, 6-4 in the second round of the French Open. Williams, a three-time French Open champion (2002, 2013 and 2015), trailed by an early service break in the second set. It was Williams' first major tournament since beating older sister Venus Williams for the 2017 Australian Open title and her first tournament on clay since losing to Garbine Muguruza in the final of the 2016 French Open. 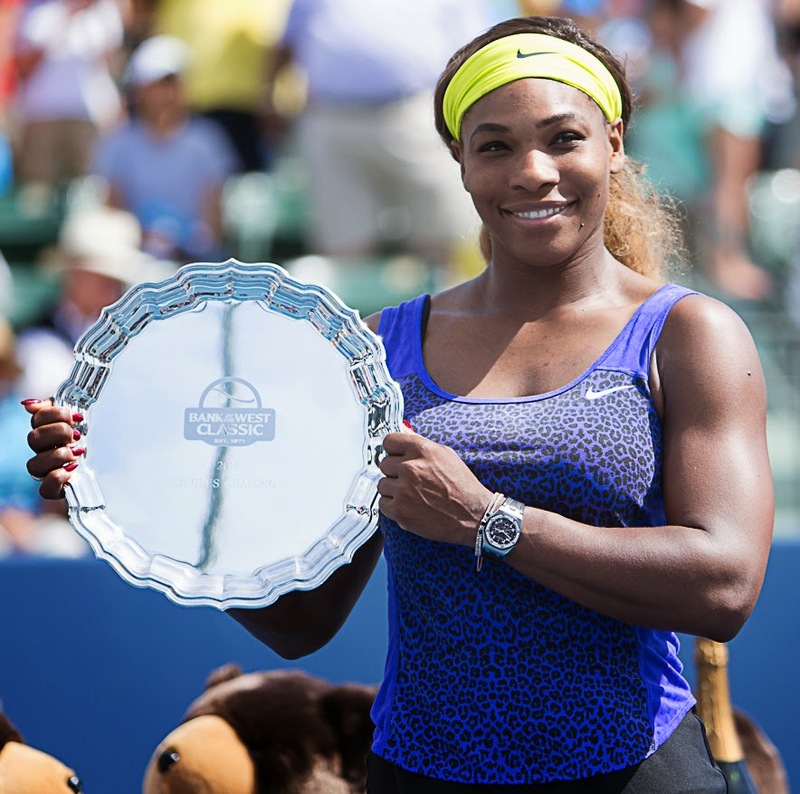 "I have definitely always had that will to win," Williams, who delivered her first child last Sept. 1, told reporters. "It was something I was born with, thank goodness. You know, this is a Grand Slam. This is my first one back. I want to do the best that I can. I want to be able to one day tell my daughter that I tried my best. When I was out there, that's all I was just trying to do." Williams, 36, is scheduled to play in Northern California for the first time in four years in the inaugural Mubadala Silicon Valley Classic, July 30-Aug. 5 at San Jose State. She won the old Bank of the West Classic at Stanford in 2011, 2012 and 2014. Williams, who needs one more Grand Slam singles title to tie Margaret Court's record of 24, next will play 11th-seeded Julia Goerges of Germany. Goerges, the doubles runner-up with Darija Jurak of Croatia at Stanford in 2013, beat Alison Van Uytvanck of Belgium 7-5, 7-6 (5). Van Uytvanck swept the singles and doubles titles in the $50,000 Stockton (Calif.) Challenger in 2016. She played doubles with Kristyna Pliskova, the twin sister of former singles world No. 1 Karolina. Williams is 2-0 against Goerges, winning 6-1, 6-1 in the second round of the 2010 French Open and 6-1, 7-6 (7) in the second round at Toronto on a hard court in 2011. Other former French Open champions advancing today, all in straight sets, were No. 3 seed Muguruza, No. 28 Maria Sharapova (2012 and 2014) and No. 1 Rafael Nadal (2005-08, 2010-14 and 2017). Top-seeded Simona Halep, a two-time French Open finalist, dominated U.S. wild card Taylor Townsend 6-3, 6-1. Lesia Tsurenko of Ukraine eliminated 15th-seeded CoCo Vandeweghe, a two-time Bank of the West runner-up, 3-6, 6-4, 6-0. Maximilian Marterer, a 22-year-old left-hander from Germany, surprised 24th-seeded Denis Shapovalov, 19, of Canada 5-7, 7-6 (4), 7-5, 6-4. Marterer reached the 2017 semifinals and 2016 quarterfinals in the $100,000 Fairfield (Calif.) Challenger. In the first round of women's doubles at Roland Garros, 11th-seeded Raquel Atawo of Sacramento and Anna-Lena Groenefeld of Germany beat Zarina Diyas of Kazakhstan and Zheng Saisai of China 6-4, 2-6, 6-2. Sam Querrey now can focus on his wedding. The 12th-seeded Querrey lost to Gilles Simon of France 1-6, 7-6 (3), 6-4, 6-1 today in the second round of the French Open in Paris. Querrey, ranked 15th, fell to 4-12 lifetime in singles at Roland Garros with four losses in his last five matches there. 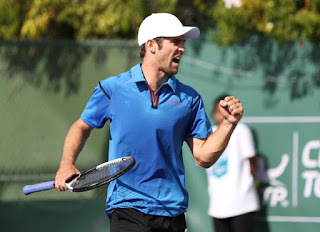 The 30-year-old San Francisco native -- who swept the singles titles on the three-week Northern California Challenger swing in 2014 -- also lost in the first round of doubles with Mike Bryan on Tuesday. Querrey, who is not playing mixed doubles, is scheduled to marry Abigail Dixon in Florida on June 9. The 33-year-old Simon is ranked 65th after climbing to a career-high sixth in 2009. He reached the final last week in Lyon, losing to Dominic Thiem. In the French Open women's draw, 10th-seeded Sloane Stephens dismissed 20-year-old Magdalena Frech of Poland 6-2, 6-2 in the second round. Stephens, the reigning U.S. Open champion who grew up in Fresno, has lost only six games in two matches. Stephens, ranked 10th, is scheduled to play Italy's Camila Giorgi, ranked 57th, on Friday. Giorgi, who routed Mariana Duque-Marino of Colombia 6-0, 6-3, has lost only eight games in two matches. Giorgi, 26, is 2-1 against Stephens, 25, all on hard courts. In doubles, former collegiate stars Ben McLachlan (Cal), Florian Lakat (Cal) and Scott Lipsky (Stanford) lost in the opening round. Marcelo Arevalo of El Salvador and Jamie Cerretani of Reading, Mass., defeated 14th-seeded McLachlan, a New Zealand native who plays for his mother's native Japan, and Jan-Lennard Struff of Germany 6-7 (4), 7-6 (3), 6-3. McLachlan and Struff reached the Australian Open semifinals in January in their first tournament together. Nikoloz Basilashvili of Georgia and John Millman of Australia beat wild cards Lakat and Arthur Rinderknech of France 6-3, 3-6, 7-5. Millman has won two singles titles in NorCal Challengers (Sacramento in 2010 and Aptos in 2015) and was the runner-up in another (Tiburon in 2014). Wild cards Benjamin Bonzi and Gregoire Jacq of France downed Americans Lipsky and Tennys Sandgren 6-2, 6-4. 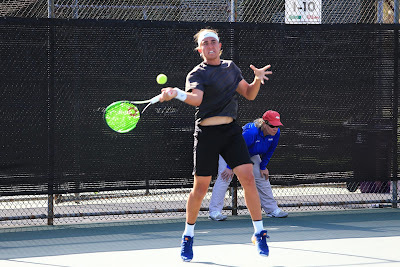 Sandgren played for the Sacramento-based California Dream of World TeamTennis in 2015, the franchise's only year of existence, and advanced to the singles final in the Tiburon Challenger last fall. Sam Querrey ended two clay-court skids today with his victory in the French Open. In an all-American matchup, the 12th-seeded Querrey dispatched 20-year-old prospect Frances Tiafoe 6-1, 6-2, 7-6 (6) in Paris. It was Querrey's first triumph of the year on clay after three losses and his first win at Roland Garros since 2014 after three consecutive first-round losses. Tiafoe reached his second ATP World Tour final of the year last month, losing to Joao Sousa of Portugal on clay in Estoril, Portugal. Tiafoe won his first ATP title in Delray Beach on hard courts in February. Querrie, a 30-year-old San Francisco native, will try to match his best French Open showing (2013) when he meets 33-year-old Frenchman Gilles Simon, who beat Nikoloz Basilashvili of Georgia 6-4, 6-0, 6-7 (4), 6-4. Simon, the runner-up to Dominic Thiem on Saturday in Lyon, has reached the fourth round of the French Open three times (2011, 2013 and 2015) for his best showings in 12 appearances. The 15th-ranked Querrey is 3-4 against Simon, who's ranked 65th after climbing to a career-high No. 6 in 2009. They are 1-1 on clay, including Simon's five-set victory in the third round of the 2013 French Open. Meanwhile, 34-year-old Guillermo Garcia-Lopez of Spain eliminated 23rd-seeded Stan Wawrinka, the 2015 champion and 2017 runner-up who's rebounding from knee surgery, 6-2, 3-6, 4-6, 7-6 (5), 6-3. Garcia-Lopez also beat Wawrinka in the opening round of the 2014 French Open. Wawrinka was bidding for his second consecutive Grand Slam title after breaking through in the Australian Open. In all-Spanish battle, 21-year-old Jaume Munar outlasted 36-year-old David Ferrer, the 2013 runner-up to -- surprise! -- Rafael Nadal, 3-6, 3-6, 7-6 (3), 7-6 (4), 7-5 in 4 hours, 15 minutes. The top-seeded Nadal, seeking his 11th French Open crown, led lucky loser Simone Bolelli of Italy 6-4, 6-3, 0-3 when rain suspended play. No. 20 seed Novak Djokovic, the 2016 champion and a three-time runner-up at Roland Garros, dismissed 34-year-old Rogerio Dutra Silva of Brazil 6-3, 6-4, 6-4. Djokovic said he has been pain-free for the past two weeks after struggling with a right elbow injury for more than two years. On the women's side, No. 2 seed Caroline Wozniacki, No. 13 Madison Keys and No. 15 CoCo Vandeweghe triumphed in straight sets. Keys defeated Vandeweghe to win the Bank of West Classic at Stanford last August. The tournament will be replaced by the Mubadala Silicon Valley Classic, July 30-Aug. 5 at San Jose State. The Wake Forest men made the most of their homecourt advantage in the NCAA Championships. After the Demon Deacons won the team title at home in Winston-Salem, N.C., on Tuesday, two of their players met in today's singles final. No. 4 seed Petros Chrysochos, a junior from Cyprus, defeated No. 7 Borna Gojo, a sophomore from Croatia, 6-3, 6-3. It was the first time in 20 years and fourth time in history that two men from the same school played for the NCAA title. In 1998, Stanford's Bob Bryan defeated Paul Goldstein in Athens, Ga. In today's women's final, No. 6 Arianne Hartono, a Mississippi senior from the Netherlands, beat No. 9-16 Ashley Lahey, a Pepperdine sophomore from Hawthorne in the Los Angeles area, 6-4, 6-2. Lahey was Hartono's third straight Pepperdine opponent. International players swept the singles titles for the first time since Cal's Suzi Babos (Hungary) and UCLA's Benjamin Kohllhoeffel (Germany) in 2006. Americans had won four consecutive men's titles and six straight women's crowns. Today's doubles finals featured four unseeded teams. UCLA's Martin Redlicki and Evan Zhu saved a match point in their 6-7 (8), 7-6 (4) [11-9] victory over Ohio State's Martin Joyce and Mikael Torpegaard. Redlicki, a senior from Boca Raton, Fla., also won the 2016 NCAA doubles title with Mackenzie McDonald, from Piedmont in the San Francisco Bay Area. As for Torpegaard, you have to feel for the guy. The senior from Denmark also lost to McDonald 6-3, 6-3 in the 2016 NCAA singles final and fell to Chrysochos in last week's singles quarterfinals in a third-set tiebreaker. Furthermore, Ohio State lost to Wake Forest 4-2 in last week's team final. LSU's Jessica Golovin and Eden Richardson outclassed Vladica Babic and Sofia Blanco of Oklahoma State 6-3, 6-2. All finals were moved indoors because of rain. Jelena Ostapenko couldn't handle the pressure of defending her French Open title. Kateryna Kozlova of Ukraine ousted Ostapenko, seeded fifth, 7-5, 6-3 on Sunday in the first round at Roland Garros. "Terrible day at the office today for me," Ostapenko, who committed 48 unforced errors and 13 double faults, told reporters. "I mean, in general, I played maybe, like, 20 percent of what I can play. Made like 50 unforced errors and so many double faults. Like, couldn't serve today. I had this unbelievable pressure. I felt that I'm not myself." Ostapenko, a Latvian who will turn 21 on June 8, became only the second defending champ to lose in the opening round of the French Open, joining 2005 champion Anastasia Myskina of Russia, and the sixth at any major tournament in the Open era. Last year, the 47th-ranked Ostapenko became the first woman since 1979 to win her first tour-level title in a Grand Slam tournament. The 24-year-old Kozlova, ranked 66th, improved to 3-0 against Ostapenko with only her second main-draw victory in a Grand Slam tournament. "I didn't expect anything from this match," conceded Kozlova, who wasn't sure two months ago whether she could play in the French Open because of damaged knee cartilage. Meanwhile, 91st-ranked Wang Qiang of China upended ninth seed and 2002 runner-up Venus Williams, who will turn 38 on June 17, 6-4, 7-5. It's the first time in Williams' career that she has lost in the first round of two consecutive Grand Slam tournaments. She fell to Belinda Bencic of Switzerland 6-3, 7-5 in the Australian Open. Also losing in the bottom half of the draw were qualifier Francesca Schiavone, the 2010 champion who will turn 38 on June 23, and Sara Errani, the 2012 runner-up. That already means there will be at least one first-time French Open finalist. The highest remaining seeds in the bottom half are No. 2 Caroline Wozniacki, No. 4 Elina Svitolina, No. 8 Petra Kvitova and No. 10 Sloane Stephens. Stephens, a 25-year-old Fresno product, crushed lucky loser Arantxa Rus of the Netherlands 6-2, 6-0 in 49 minutes. Rus, a 27-year-old left-hander ranked 106th, had only two winners and 25 unforced errors. Stephens, who won her first major title in last year's U.S. Open in her fifth tournament back from foot surgery, will play qualifier Magdalena Frech of Poland for the first time in the second round. The 20-year-old Frech, ranked 137th, defeated Ekaterina Alexandrova of Russia 6-3, 3-6, 6-3. Note -- After reaching the semifinals in Lyon last week, Cameron Norrie of Great Britain cracked the top 100 for the first time at No. 85. The 22-year-old left-hander turned pro only one year ago after his junior year at Texas Christian University in Fort Worth. Norrie, who stunned No. 10 John Isner in the Lyon quarterfinals, swept the $100,000 Tiburon and Stockton Challengers in consecutive weeks in Northern California last fall. For the first time in 20 years and fourth time in history, two men from the same school will play for the NCAA title. No. 4 seed Petros Chrysochos and No. 7 Borna Gojo of NCAA champion Wake Forest are scheduled to meet on Monday at 10:30 a.m. PDT on their home courts in Winston-Salem, N.C.
Chrysochos, a junior from Cyprus, beat No. 1 Martin Redlicki of UCLA 6-1, 4-6, 6-4 early today. Then Gojo, a sophomore from Croatia, downed No. 3 Nuno Borges of Mississippi State 2-6, 7-5, 6-2. Chrysochos and Gojo became the first men from the same school to reach the NCAA final since Stanford's Bob Bryan defeated Paul Goldstein in Athens, Ga., in 1998. Bryan has gone on to a professional doubles career that will land him and twin brother Mike, who also starred at Stanford, in the International Tennis Hall of Fame. Goldstein is now Stanford's coach. In Monday's women's final, No. 6 Arianne Hartono of Mississippi will face her third straight Pepperdine player, No. 9-16 Ashley Lahey, at 9 a.m.
Hartono, a senior from the Netherlands, edged Mayar Sherif of Pepperdine 2-6, 7-6 (5), 7-6 (2). Sherif, a senior from Egypt who transferred from Fresno State two years ago, served for the match twice in the second set and had match points at 5-4. Lahey, a sophomore from Hawthorne in the Los Angeles area, outplayed No. 8 Fernanda Contreras of Vanderbilt 6-3, 6-3. Stanford nipped the Commodores 4-3 on Tuesday for its second NCAA team title in three years and record 19th overall. Monday's NCAA doubles finals will feature four unseeded teams. Redlicki and Evan Zhu will meet Martin Joyce and Mikael Torpegaard of Ohio State at 1 p.m., and Jessica Golovin and Eden Richardson of LSU will play Vladica Babic and Sofia Blanco of Oklahoma State at a time to be announced. All finals will be streamed live. Northern California players are done in the NCAA Singles and Doubles Championships. Emily Arbuthnott, a Stanford sophomore from England, and Cameron Klinger, a Vanderbilt junior from San Jose, lost today in the singles round of 16 in Winston-Salem, N.C.
No. 9-16 seed Astra Sharma, a Vanderbilt senior from Australia, defeated Arbuthnott 6-2, 6-4. Stanford edged Vanderbilt 4-3 on Tuesday for its second NCAA team title in three years. Sharma beat Arbuthnott in doubles; they did not meet in singles. No. 2 seed William Blumberg of North Carolina beat Klinger 6-4, 6-1. Blumberg reached last year's final as a freshman, losing to senior Thai-Son Kwiatkowski of Virginia. By reaching the round of 16, Arbuthnott and Klinger earned All-America status. Sharma will meet Mayar Sherif, a Pepperdine senior who transferred from Fresno State two years ago, on Friday. The other women's quarterfinal matchups are No. 6 seed Arianne Hartono of Mississippi against Luisa Stefani of Pepperdine, No. 9-16 Ashley Lahey of Pepperdine versus No. 9-16 Andrea Lazaro of Florida International and No. 8 Fernanda Contreras of Vanderbilt against No. 9-16 Anna Danilina of Florida. Blumberg will face No. 7 Borna Gojo of host and NCAA champion Wake Forest. The other men's quarterfinal matchups are No. 1 Martin Redlicki of UCLA against No. 9-16 Mazen Osama of Alabama, No. 4 Petros Chrysochos of Wake Forest versus No. 6 Mikael Torpegaard of Ohio State and No. 3 Nuno Borges of Mississippi State against No. 9-16 Timo Stodder of Tennessee. Only two women, Contreras and Lahey, and two men, Redlicki and Blumberg, in the quarterfinals are American. Billy Griffith, a Cal senior from Fresno, ousted No. 8 seed Ryotaro Matsumura of Kentucky 6-4, 6-3 today in the first round of the NCAA Men's Singles Championships in Winston-Salem, N.C.
Griffith, ranked No. 54, is scheduled to play No. 18 Jose Salazar of Arkansas on Thursday at 6 a.m. PDT. All matches are being streamed live. Cameron Klinger, a Vanderbilt junior from San Jose, knocked off No. 9-16 seed Alex Knight of Michigan 6-4, 6-0. Klinger, ranked No. 26, will take on No. 29 Mitch Harper of Virginia Tech at 5 a.m.
Victor Pham of Columbia and Saratoga in the San Francisco Bay Area topped Jordi Arconada of Texas A&M 6-7 (5), 7-5, 6-3. Pham, a junior, will meet 9-16 seed Alfredo Perez of Florida at 8:30 a.m.
No. 9-16 seed Tom Fawcett, a Stanford senior and 2017 semifinalist, lost to Giovanni Oradini of Mississippi State 3-6, 6-4, 6-3. Top-seeded Martin Redlicki of UCLA beat Tim Sandkaulen of Mississippi 4-6, 6-4, 6-1. On the women's side, Stanford's Michaela Gordon and Emily Arbuthnott advanced one day after the Cardinal won its second NCAA crown in three years. Gordon, a freshman from Saratoga seeded 9-16, dismissed Fatima Bizhukova of Wichita State 6-2, 6-3. Arbuthnott beat Ingrid Gamarra Martins of South Carolina 6-3, 7-5. Gamarra Martins replaced fourth-seeded Samantha Harris of Duke after Harris withdrew. Gordon, ranked 15th, is scheduled to face No. 21 Gabriela Talaba of Texas Tech on Thursday. The 43rd-ranked Arbuthnott will play No. 52 Josie Kuhlman of Florida. Both matches are scheduled for 8 a.m.
Melissa Lord, who won the deciding match in Stanford's 4-3 victory over Vanderbilt in the NCAA final, lost to No. 9-16 seed Andrea Lazaro of Florida International 6-4, 6-1. Alternate Felicity Maltby of Texas Tech and Sunnyvale in the Bay Area routed Maria Kononova of North Texas 6-1, 6-1. Maltby, a junior ranked No. 58, will face Vanderbilt's Fernanda Contreras, ranked and seeded 10th, at 7:30 a.m.
Top-seeded Bianca Turati of Texas fell to Pepperdine's Luisa Stefani, a semifinalist two years ago as a freshman, 7-6 (6), 4-6, 6-3. All three Cal women in NCAA singles -- junior Olivia Hauger and freshmen Anna Bright and Julia Rosenqvist -- lost in the opening round. --Griffith and J.T. Nishimura, a senior from San Jose, will take on second-seeded William Blumberg and Robert Kelly of North Carolina at 11:30 a.m.
--Klinger and Billy Rowe will face Austin Rapp and Keegan Smith of UCLA at 12:30 p.m.
--Arbuthnott and Gordon will meet Chandler Carter and Emma Davis of host Wake Forest at 1:30 p.m.
--And Fawcett and Axel Geller will play fourth-seeded Johannes Ingildsen and Perez at 2 p.m.
Former Stanford teammates Carol Zhao and Kristie Ahn each lost 6-3 in the third set today in the first round of French Open qualifying in Paris. Zhao, a 22-year-old Canadian, fell to 37-year-old Italian Francesca Schiavone, the 2010 champion at Roland Garros, 6-4, 3-6, 6-3. The match had been suspended by rain at one set apiece on Tuesday. Ahn, 25, from Upper Saddle River, N.J., bowed out to Bibiane Schoofs of the Netherlands 7-6 (2), 2-6, 6-3. U.S. women went 6-4 in the first round of French Open qualifying, including Caroline Dolehide's victory over fellow American Irina Falconi. U.S. men, meanwhile, went 2-9. 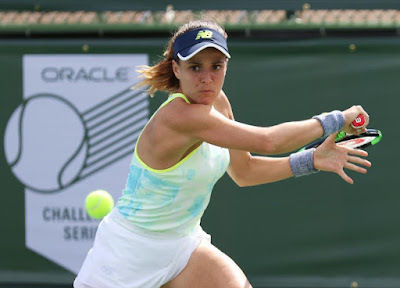 Nicole Gibbs, who won two NCAA titles in singles (2012 and 2013) and one in doubles (2012) before leaving Stanford one year early, is scheduled to play Veronika Kudermetova of Russia for the first time on Thursday in the second round of qualifying. Naturally, it came down to Melissa Lord. And naturally, she came through. That's how it works for the Stanford women. Lord, a junior All-American from Bloomfield, Conn., lifted the 15th-seeded Cardinal to a 4-3 victory over top-seeded Vanderbilt today in the final of the NCAA Championships in Winston-Salem, N.C.
Stanford won its second NCAA championship in three years and record 19th overall. Florida ranks second with seven. Lord, ranked 40th after missing the first half of the spring season with a shoulder injury, outlasted No. 10 Fernanda Contreras of Vanderbilt 6-4, 2-6, 7-5 on Court 2 in Stanford's third consecutive NCAA final. The Cardinal lost to Florida 4-1 last year in Athens, Ga. It was the first clincher of the season for Lord, who improved to 15-0 over her career in NCAA team matches. Without Lord, Stanford fell to Vanderbilt 7-0 on Feb. 3 in Nashville, Tenn. In the first week of March, the Cardinal was ranked 46th, its lowest position ever, at 4-3 with losses to the Commodores, Texas and Florida. Stanford, however, finished the year with 20 straight victories and matched its 2016 record as the lowest-seeded team to win the NCAA championship. The Cardinal also won the title in 2013 as the 12th seed and in 2010 as the eighth seed. Having ousted, in succession, No. 2 North Carolina, No. 7 Georgia, No. 3 Duke and Vanderbilt in this year's tournament, Stanford has won 20 of its last 23 NCAA Tournament matches when seeded lower than its opponent. With its 117th NCAA title in all men's and women's sports, Stanford moved one spot ahead of UCLA for the all-time lead. Stanford lost the doubles point against Vanderbilt, as it did against North Carolina in the Sweet 16 and Duke in the Final Four. The Cardinal has won 15 of its last 20 matches, spanning three years, when dropping the doubles point. Michaela Gordon, a freshman from Saratoga in the San Francisco Bay Area, lost at No. 1 doubles and No. 1 singles against Vanderbilt. No. 11 Contreras and Astra Sharma defeated No. 3 Emily Arbuthnott and Gordon 6-3, and No. 11 Sharma beat No. 15 Gordon 7-6 (3), 6-3. In the men's final, top seed and host Wake Forest beat third-seeded Ohio State 4-2 for its first NCAA title. The Demon Deacons became the first team other than USC or Virginia to win the men's crown since Georgia in 2008. The NCAA Singles and Doubles Championships begin Wednesday and Thursday, respectively, in Winston-Salem. The matches will be streamed live. No. 9-16 seed Tom Fawcett, a Stanford senior and 2017 semifinalist, is scheduled to play Giovanni Oradini of Mississippi State at 8 a.m. PDT. Cameron Klinger (San Jose), Vanderbilt, vs. Alex Knight (9-16), Michigan, 6 a.m.
Billy Griffith (Fresno), Cal, vs. Ryotaro Matsumura (8), Kentucky, 8 a.m.
Victor Pham (Saratoga), Columbia, vs. Jordi Arconada, Texas A&M, 11:30 a.m.
Fawcett-Axel Geller, Stanford, vs. Johannes Ingildsen-Alfredo Perez (4), Florida. Klinger (San Jose)-Billy Rowe, Vanderbilt vs. Austin Rapp-Keegan Smith, UCLA. Griffith (Fresno)-J.T. Nishimura (San Jose), Cal, vs. William Blumberg-Robert Kelly (2), North Carolina. Olivia Hauger, Cal, vs. Anna Danilina (9-16), Florida, 5 a.m.
Julia Rosenqvist, Cal, vs. Megan McCray, Oklahoma State, 10 a.m.
Felicity Maltby (Sunnyvale), Texas Tech, vs. Maria Kononova, North Texas, 10:30 a.m.
Anna Bright, Cal, vs. Julia O'Loughlin, Denver, 11 a.m.
Melissa Lord, Stanford, vs. Andrea Lazaro (9-16), Florida International, 12:30 p.m.
Michaela Gordon (9-16, Saratoga), Stanford, vs. Fatima Bizhukova, Wichita State, 1 p.m.
Emily Arbuthnott, Stanford, vs. Samantha Harris (4), Duke, 1 p.m.
Arbuthnott-Gordon (3), Stanford, vs. Chandler Carter-Emma Davis, Wake Forest. American men went 1-6 today in the first round of qualifying for the French Open in Paris. No. 7 seed Denis Kudla of Arlington, Va., and Tampa, Fla., topped Guilherme Clezar of Brazil 6-3, 6-7 (1), 7-5 in 2 hours, 23 minutes. Losing were No. 11 Tim Smyczek, San Jose product Dennis Novikov, Ernesto Escobedo, Donald Young, Evan King and Christopher Eubanks. Duckhee Lee of South Korea beat Novikov, a 24-year-old former UCLA standout who lives in Los Angeles, 6-2, 6-2. Four more U.S. men will play their qualifying openers on Tuesday: ex-Stanford All-American Bradley Klahn, 6-foot-11 (2.11-meter) Reilly Opelka, Stefan Kozlov and Kevin King. Women's qualifying will begin Tuesday, with two other former Stanford stars scheduled to play. No. 8 Nicole Gibbs of Venice in the Los Angeles area will face Han Xinyun of China, and No. 23 Carol Zhao of Canada will take on 37-year-old Italian Francesca Schiavone, the 2010 champion. This is looking a lot like 2016 for the Stanford women. Then, the Cardinal became the lowest-seeded team to win the NCAA championship at No. 15. Stanford (23-3) can match that feat when it faces Vanderbilt (27-3), seeded first and ranked second, on Tuesday at 10 a.m. PDT in Winston-Salem, N.C. The match will be streamed live. The Cardinal, which has overcome early-season injuries, beat third-ranked Duke, playing near home, 4-2 today. The Commodores defeated fourth-ranked Georgia Tech 4-2. Stanford extended its winning streak to 19 matches and reached the NCAA final for the third consecutive year. The Cardinal lost to Florida 4-1 last year in Athens, Ga.
Stanford also won the NCAA title as the No. 12 seed in 2013 and No. 8 seed in 2010. Overall, the Cardinal has won 19 of its last 22 NCAA matches when seeded lower than its opponent. Stanford's Michaela Gordon, a freshman from Saratoga in the San Francisco Bay Area, lost at No. 1 doubles and No. 1 singles against Duke. No. 9 Ellyse Hamlin and Kaitlyn McCarthy beat No. 3 Emily Arbuthnott and Gordon 6-3 as the Blue Devils won the doubles point. No. 6 Samantha Harris topped No. 15 Gordon 6-2, 7-6 (3) to cut Stanford's lead to 3-2 before No. 93 Caroline Lampl topped No. 116 McCarthy 2-6, 6-3, 6-2. In Tuesday's men's final, No. 1 Wake Forest (30-2) will meet No. 3 Ohio State (34-2). The Buckeyes defeated No. 2 UCLA 4-1 in a nearly seven-hour match featuring two lightning delays. On Court 4, No. 96 Kyle Seelig of Ohio State beat No. 103 Logan Staggs, a senior from Tracy in Northern California, 6-3, 3-6, 6-3. Staggs did not play doubles. The No. 2 UCLA men, with senior Logan Staggs of Tracy in Northern California, edged No. 10 USC 4-3 today to reach the semifinals of the NCAA Championships in Winston-Salem, N.C. The Bruins (30-2) improved to 4-0 against their crosstown rival this season. Top-ranked Martin Redlicki clinched the victory by topping No. 11 Brandon Holt, the son of International Tennis Hall of Famer Tracy Austin, 6-4, 4-6, 6-2 on Court 1. USC's Laurens Verboven defeated No. 103 Staggs, a senior left-hander, 3-6, 6-1, 6-0 on Court 4. Staggs did not play doubles. UCLA will play No. 3 Ohio State (33-2) on Monday. The Buckeyes nipped No. 7 Mississippi State 4-3 to reach the NCAA semis for the second consecutive year. Also, No. 1 Wake Forest (29-2) and No. 5 Texas A&M (26-5) reached the semis for the first time. The Stanford women beat another higher-seeded team in the NCAA Championships today, and it wasn't even close. The No. 15 Cardinal routed No. 7 Georgia 4-0 to reach the semifinals in Winston-Salem, N.C. Stanford (22-3) has won 18 matches in a row and 18 of its last 21 NCAA matches as the lower seed. Stanford received singles wins from, in chronological order, No. 40 Melissa Lord on Court 2, No. 93 Caroline Lampl on Court 3 and No. 43 Emily Arbuthnott on Court 4. The Cardinal's Michaela Gordon, a freshman from Saratoga in the San Francisco Bay Area, did not finish her matches at No. 1 doubles and No. 1 singles. She is ranked third in doubles with Arbuthnott and 15th in singles. Stanford will seek its third consecutive berth in the final when it faces No. 3 Duke (27-3) on Monday at 9 a.m. PDT. The Cardinal lost to Florida 4-1 last year in Athens, Ga., and beat Oklahoma State 4-3 in 2016 in Tulsa, Okla. Stanford has won a record 18 NCAA team titles, 11 more than second-place Florida. Duke beat No. 11 Texas Tech, with junior Felicity Maltby of Sunnyvale in the Bay Area, 4-1. Maltby won at No. 2 doubles to help the Red Raiders lead 1-0 but lost to Meible Chi at No. 2 singles 2-6, 6-2, 6-4. Chi and Maltby are ranked No. 55 and No. 58, respectively, in singles. In the other semifinal, No. 2 Vanderbilt (26-3) is scheduled to meet No. 4 Georgia Tech (25-5) on Monday, also at 9 a.m. PDT. The Yellow Jackets nipped No. 14 UCLA, with junior Alaina Miller of Saratoga, 4-3 after trailing 3-1. Miller won at No. 3 doubles as the Bruins won the point and at No. 6 singles. Miller, ranked No. 121 in singles, defeated Victoria Flores 6-3, 6-4 on Court 6. The UCLA men, featuring senior Logan Staggs of Tracy, today reached the Elite Eight in the NCAA Championships for the 23rd time in 25 seasons under head coach Billy Martin. The No. 2-ranked Bruins defeated No. 15 Michigan 4-2 at the University of North Carolina in Chapel Hill. The match was delayed by rain and moved from Wake Forest University in Winston-Salem, N.C.
Mattias Siimar beat Staggs, a 5-foot-9 (1.74-meter) left-hander ranked 103rd, 6-2, 6-4 on Court 4 to cut UCLA's lead to 3-1. Staggs did not play doubles. The Bruins (29-2) will face crosstown rival USC, ranked No. 10, on Sunday. The Trojans (20-8) topped No. 6 North Carolina 4-2 in Winston-Salem. UCLA is 3-0 this year against USC, including a 4-1 victory in the final of the Pac-12 Championships in Ojai, Calif., last month. USC leads all schools with 21 NCAA team titles, and UCLA ranks third with 16, one behind Stanford. The Trojans last won the championship in 2014 and the Bruins in 2005. The last school besides Virginia or USC to win the NCAA crown was Georgia in 2008. The three-time defending champion Cavaliers lost to Columbia in the second round this year. No. 16 Columbia, with two players from Northern California, lost to No. 1 Wake Forest 4-1 today at Wake Forest. No. 7 Borna Gojo of the Demon Deacons defeated No. 27 Victor Pham, a junior from Saratoga in the San Francisco Bay Area, 7-5, 6-3 on Court 1. Huang, a freshman from the Sacramento suburb of Elk Grove, topped Christian Seraphim, a 6-foot-10 (2.08-meter) senior from Germany, 6-1, 6-4 on Court 5. In doubles, No. 21 Gojo and Skander Mansouri led No. 47 Pham and Jackie Tang 5-4 when the match was abandoned. Huang did not play doubles. Wake Forest (28-2) will play No. 9 Illinois, which eliminated No. 8 Texas Christian 4-1. Keenan Mayo of Roseville has signed a letter of intent at Illinois, and Jenson Brooksby of Carmichael has verbally committed to Texas Christian. Roseville and Carmichael are in the Sacramento area. Huang and Brooksby train at the JMG Tennis Academy in Sacramento. SACRAMENTO, Calif. -- Jenson (J.T.) Brooksby had scholarship offers from every big-time tennis university. Somewhat surprisingly, the Sacramento-area resident chose eighth-ranked Texas Christian. Brooksby verbally committed to the small, private school in Fort Worth shortly after winning the boys 18 singles title in the prestigious Easter Bowl on April 1. The 17-year-old high school junior from Carmichael said Wednesday that he will sign his binding National Letter of Intent "as soon as possible" -- Nov. 14 is signing day -- and enroll either in the fall of 2019 or in January 2020. "I felt the coaching was really good, the school fit itself was really good, I like the smaller school size, and they're really dedicated to (developing) pro players," Brooksby said after practice at the JMG Tennis Academy at the Arden Hills Resort and Spa. "I feel like their individual training for the players is really good as well. So I felt it was the best fit overall." Brooksby chose TCU and Fort Worth over UCLA and Los Angeles. TCU's undergraduate enrollment of 8,891 is almost one-fourth of UCLA's, and Fort Worth's population of 854,113 is almost one-fifth of Los Angeles'. Brooksby, a Sacramento native, has been home-schooled since the sixth grade and coached by Joseph Gilbert (no relation to renowned commentator and coach Brad Gilbert), JMG's founder and owner, since age 7. "It's a smaller bubble (at TCU), and that's very much what he has here," said Gilbert, who also has sent Collin Altamirano and Camille Favero to Virginia, Brandon Sutter to Stanford, Austen Huang to Columbia, Kassidy Jump to Arizona State and current pupil Eric Hadigian to Arizona. Altamirano, the USTA boys 18 champion in 2013, helped the Cavaliers win three NCAA team titles before turning pro last year. But Brooksby said Virginia is "too far away." Stanford and Cal are near Sacramento, but Brooksby added that they offered less than full scholarships. And Cal, like UCLA, has an undergraduate enrollment over 30,000. Brooksby, whose father is an anesthesiologist, said TCU and UCLA were among about 20 schools to offer him a rare full ride. Men's programs are allowed only 4.5 scholarships versus eight for women. Title IX requires equal opportunities, and women don't play football. TCU, under head coach David Roditi and assistant coach Devin Bowen, will try to reach the Elite Eight in the NCAA Championships for the second consecutive year when it faces No. 9 Illinois today in Winston-Salem, N.C. The Horned Frogs (20-4) are led by Alex Rybakov, a junior from Coral Springs, Fla. He is ranked No. 21 in singles and No. 6 in doubles (with senior Guillermo Nunez of Chile) by the Intercollegiate Tennis Association. Cameron Norrie, a left-hander from Great Britain, is ranked No. 102 in the world only one year after turning pro following his junior season at TCU. He won the $100,000 Tiburon and Stockton Challengers in Northern California back-to-back last fall. College coaches are prohibited from discussing recruits until they sign letters of intent. Brooksby has played in tournaments on the USTA Pro Circuit since he was 14. He reached the singles quarterfinals and doubles semifinals (with Altamirano) in the Claremont (Calif.) Futures last September and advanced to the final round of qualifying in the $100,000 San Francisco Challenger in February. Brooksby, who plays few junior tournaments, is ranked 34th nationally in the 18s. His gold ball in the Easter Bowl was his second. He also won the national hard court 12s in 2013 in Little Rock, Ark. In 2016, Brooksby advanced to the 16s final of the national hard courts in Kalamazoo, Mich., and the national clay courts in Delray Beach, Fla. The 6-foot-1 (1.85-meter), 155-pound (70.3-kilogram) Brooksby's strengths are competitiveness and precise groundstrokes. "He doesn't have huge weapons," Gilbert conceded, "but he doesn't have a lot of holes. When he's able to get rallies going and keep (opponents) out there for two or three hours, (their games) break down over time. ... It's not easy to see because he doesn't do it by a huge serve or a big forehand winner. It's a process that he breaks guys down with. He does it very well." Brooksby is working to add power to his serve and curb his emotions. "His competitiveness is a blessing in some ways and hurts him in other ways," Gilbert said. "He has to constantly be working on controlling it so he can focus on the game plan. Sometimes the score and the emotions get the best of him. At the Easter Bowl, he was frustrated (in the final). You saw that. He was more focused on the win and the score than the game plan." In the Easter Bowl final at Indian Wells, the unseeded Brooksby beat top-seeded Tristan Boyer of Altadena in the Los Angeles area 5-7, 6-4, 6-3. Brooksby squandered a 5-2 lead in the first set and almost blew a 5-0 lead in the third set. He held on after serving at 5-3, 0-30. Brooksby also can become passive on the court. "Sometimes he relies on his consistency and gets too 'pushy' waiting for guys to miss," Gilbert said. "That's when he gets in the most trouble instead of having a plan with every shot. Once he's doing that, he's really strong." Off the court, the sports-loving Brooksby is polite and down-to-earth. "He has a very good heart," Gilbert said. "He means well. He wants to do the right thing. He's grown up in a small town. He has an innocent mindset. I like that about him." The North Carolina women were ranked No. 1. They were playing only 90 minutes from home. And they won the double point. As usual, though, none of it mattered to Stanford. The No. 15-ranked Cardinal ousted the Tar Heels 4-1 today to reach the Elite Eight in the NCAA Championships in Winston-Salem, N.C. It was the Cardinal's 17th consecutive victory. Stanford (21-3) has won 17 of its last 20 NCAA matches when seeded lower than its opponent, according to gostanford.com. The stretch dates to 2010 and has produced three national championships (2010, 2013 and 2016). The Cardinal has won a record 18 NCAA team titles, 11 more than second-place Florida. Stanford's Michaela Gordon, a freshman from Saratoga in the San Francisco Bay Area, won at No. 1 doubles and trailed at No. 1 singles when the match was abandoned. No. 3 Emily Arbuthnott and Gordon defeated No. 4 Jessie Aney and Alexa Graham 6-4, and No. 2 Makenna Jones led No. 15 Gordon 7-6 (2), 1-2. The Cardinal will play No. 7 Georgia (18-6) on Saturday. The Bulldogs edged South Carolina, featuring two Bay Area players, 4-3 in Winston-Salem. No. 63 Paige Cline, a junior from Kentfield, and Hadley Berg, a senior from Greenbrae, won on Court 1 as the Gamecocks (21-7) took the doubles point. Mariana Gould beat Cline 6-4, 6-1 on Court 4 to give Georgia a 2-1 lead before No. 34 Berg beat No. 75 Kennedy Shaffer 6-2, 6-4 on Court 2 for a 2-2 tie. Also advancing in Winston-Salem were No. 11 Texas Tech, with junior Felicity Maltby of Sunnyvale, and No. 14 UCLA, with junior Alaina Miller of Saratoga. The Red Raiders (23-6) surprised No. 6 Texas 4-1, ending the Longhorns' winning streak at 19 matches. Maltby and Gabriela Talaba triumphed 6-1 on Court 2 to help Texas Tech earn the doubles point. No. 30 Anna Turati led No. 58 Maltby 2-6, 7-5, 3-2 on Court 2 when their match was halted. Texas Tech will face No. 3 Duke (26-3), also playing near home, on Saturday. UCLA knocked off No. 6 Mississippi 4-1 for the Bruins' 14th win in their last 15 matches. Miller clinched the victory with a 6-7 (4), 6-4, 6-3 decision over Alexa Bortles on Court 6. Miller also won with Ena Shibahara on Court 3 as UCLA swept the doubles matches. The Bruins (23-5) will play No. 4 Georgia Tech (24-5) on Saturday. In the other quarterfinal, No. 2 Vanderbilt (25-3) will meet No. 21 Florida State (21-8). William Genesen had three match points to send the Stanford men to the Sweet 16 of the NCAA Championships in Winston-Salem, N.C. But Mississippi's Finn Reynolds, a freshman from New Zealand, survived the predicament and went on to beat Genesen, a sophomore from Tulsa, Okla., 3-6, 7-6 (6), 6-2 on Court 6 and give the No. 38 Rebels a 4-3 victory over the No. 4 Cardinal today at Stanford. Genesen led 2-0 in the third set. Mississippi (16-12) went ahead 2-0, but the Cardinal (22-4) rallied for a 3-2 advantage. No. 33 Tim Sandkaulen defeated No. 83 Axel Geller, a freshman from Argentina who reached No. 1 in the world junior rankings last November, 7-6 (4), 6-3 on Court 2 to tie the score before Reynolds' heroics. No. 16 Columbia, with three Northern California players, beat three-time defending champion Virginia 4-2 in New York on Saturday to reach the last 16. No. 27 Victor Pham, a junior from Saratoga in the San Francisco Bay Area, lost to No. 24 Carl Soderlund 6-1, 7-6 (5) on Court 1. Austen Huang, a freshman from Elk Grove in the Sacramento area, defeated Matthew Lord 6-4, 6-1 on Court 5. Alex Keyser, a sophomore from Danville in the Bay Area, did not play. Columbia (19-4) will face top-ranked Wake Forest (27-2) on Friday in Winston-Salem. No. 2 UCLA, with senior Logan Staggs of Tracy (near San Francisco), dominated No. 39 San Diego 4-0 today. No. 22 Vanderbilt, with junior Cameron Klinger of San Jose, lost to No. 9 Illinois 4-0 in Champaign, Ill. Klinger fell at No. 1 singles and doubles. On Saturday, No. 15 Stanford and three other women's teams with NorCal players advanced to the Sweet 16 in Winston-Salem. No. 10 South Carolina features senior Hadley Berg of Greenbrae and junior Paige Cline of Kentfield. Playing for No. 11 Texas Tech is junior Felicity Maltby of Sunnyvale. Also, No. 14 UCLA has junior Alaina Miller of Saratoga. for her third title in the Bank of the West Classic at Stanford. In March, the consensus greatest male player of all time made his first appearance in the San Francisco Bay Area. This summer, probably the greatest female player ever plans to play in the Bay Area for the first time in four years. Serena Williams, attempting a comeback at 36 after having her first child last September, is scheduled to play in the inaugural Mubadala Silicon Valley Classic at San Jose State. The tournament, which replaces the longtime Bank of the West Classic at Stanford, is set for July 30-Aug. 5. Roger Federer defeated Jack Sock 7-6 (9), 6-4 on March 5 in a lighthearted exhibition before a sellout crowd of 17,496 at SAP Arena in San Jose. Williams has played in only two tournament this year, reaching the third round at Indian Wells and losing in the first round at Miami, both in March. She withdrew from next week's Italian Open, saying she needs more time to be "100 percent ready to compete." CiCi Bellis, a 19-year-old product of Atherton in the Bay Area, will replace Williams in the Rome draw. Bellis has been sidelined since late March with an arm injury. Williams will join another former world No. 1, Maria Sharapova, in the San Jose field. Also entered are defending champion and 2017 U.S. Open runner-up Madison Keys and two-time Bank of the West finalist CoCo Vandeweghe. For Mubadala ticket information, go to MubadalaSVC.com or call (866) 982-8497. Less than two years after turning pro, diminutive Mackenzie McDonald is on the verge of cracking the top 100 in the world. The fifth-seeded McDonald, a 23-year-old product of Piedmont in the San Francisco Bay Area, topped third-seeded Jordan Thompson of Australia 1-6, 6-4, 6-1 today to win the $100,000 Seoul Challenger. McDonald, only 5-foot-10 (1.78 meters) and 160 pounds (73 kilograms), jumped 32 places in the rankings to No. 114. He almost lost to 6-foot-5 (1.96-meter) Lloyd Harris, a 21-year-old South African, in the Seoul quarterfinals, surviving 6-7 (4), 7-6 (8), 6-3. McDonald, now based in Miami, earned his second career Challenger singles title. He defeated former Stanford star Bradley Klahn to win the $100,000 Northbay Healthcare Men's Pro Championships in Fairfield, 38 miles (61 kilometers) north of Piedmont, last October. McDonald turned pro in June 2016 after sweeping the NCAA singles and doubles titles as a UCLA junior. He became the first man to accomplish the feat since Matias Boeker of Georgia in 2001. ATP Tour -- Unseeded Dominic Inglot of Great Britain and Robert Lindstedt of Sweden edged top-seeded Ben McLachlan of Japan and Nicholas Monroe of Austin, Texas, 3-6, 6-3 [10-8] to win the Istanbul Open on clay. Lindstedt, 41, played at Fresno State before transferring to Pepperdine and reaching the 1998 NCAA doubles final with Kelly Gullett. They lost to Bob and Mike Bryan of Stanford. McLachlan, a 25-year-old former Cal All-American, was born and raised in New Zealand but plays for his mother's native country. He and Jan-Lennard Struff of Germany advanced to the semifinals of the Australian Open in January in their first tournament together. In the Istanbul singles final, 25-year-old Taro Daniel of Japan beat Malek Jaziri of Tunisia 7-6 (4), 6-4 for his first career ATP title. Both players were unseeded. Daniel was born in New York to an American father, Paul, and Japanese mother, Yasue. The family moved from New York to Japan when Taro was an infant and to Spain when he was 14. Paul Daniel grew up in Santa Cruz, 73 miles (117.5 kilometers) south of San Francisco on the Pacific Ocean. The Stanford men and women could make deep runs in this month's NCAA Tournament. The Cardinal men (21-3) are seeded fourth, and the 15th-seeded women (18-3) have a 14-match winning streak after struggling with injuries early in the season. In the first round on May 12 at Stanford's Taube Family Tennis Stadium, the Cardinal men will meet New Mexico State at 1 p.m., and Duke will play Mississippi at 10 a.m.. The two winners will meet on May 13 at 2 p.m. at Stanford. The NCAA announced the 64-team men's and women's brackets today. Stanford completed its best regular season in 17 years under fourth-year coach Paul Goldstein. The fourth-ranked Cardinal has won 17 NCAA team titles, second to USC's 21 and one ahead of UCLA, but none since 2000. Stanford will face New Mexico State (16-8) for the first time. All first- and second-round men's and women's matches are played at campus sites. The final 16 men's and 16 women's teams advance to the NCAA Championships, May 17-22 in Winston-Salem, N.C. The NCAA Singles and Doubles Championships are set for May 23-28 in Winston-Salem. The Cal men (11-9), ranked No. 32, will take on No. 22 North Carolina State (17-8) for the first time on May 11 at 11 a.m. PDT in Austin, Texas. Texas, seeded 11th and ranked 15th, will host Bryant at 2 p.m.
Second-seeded UCLA (26-2), with senior Logan Staggs of Tracy at No. 4 singles, will host Idaho (15-7) on May 12 at noon. In the first round of the women's tournament, Stanford will host St. John's (17-5) on May 11 at 2 p.m. The Cardinal leads all schools with 18 NCAA team titles (Florida is next with seven). Stanford has reached the last two finals and five of the last eight, winning in 2010, 2013 and 2016. Michaela Gordon, a freshman from Saratoga, plays No. 1 singles and doubles for the Cardoma;. She is ranked 16th in singles and second in doubles with sophomore Emily Arburthnott of England. In another first-round match at Stanford on May 11, Michigan (17-9) will meet Hawaii (12-6) at 11 a.m. The winners of the two matches will meet on May 12 at 4 p.m.
Twelfth-seeded UCLA (20-5), with junior Alaina Miller of Saratoga at No. 6 singles and No. 3 doubles, will host Fresno State (12-12) on May 11 at 1 p.m.